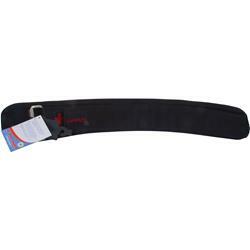 Extra wide 3 inch support strap provides maximum lower back and abdominal support for heavier lifts. Thick but flexible heavy duty nylon webbing provides maximum comfort and durability while maintaining muscle warmth. Heavy gauge steel rollerbuckle makes tension easy.